Tiger Muay Thai and MMA training camp, Phuket Thailand fighters took collective “pride” in running up a 5-1 record in recent Thai boxing fights at patong and Bangla Muay Thai Stadiums on July 2-4, 2010, Phuket, Thailand. On July 2nd at Patong Thai Boxing stadium, guests Stuart and Jared scored KO wins in the 3rd and 2nd rounds respectively. 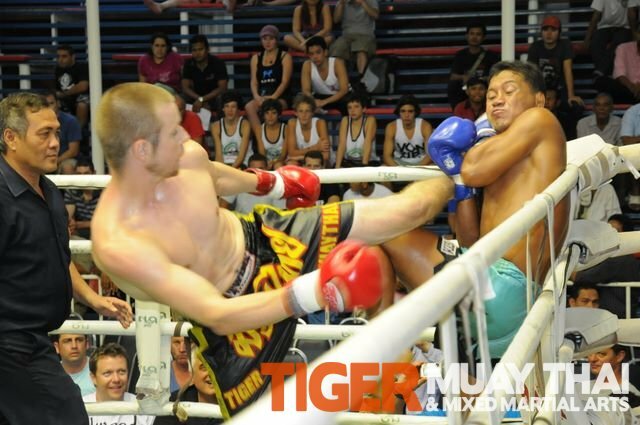 On July 3, it was a special evening as Tiger Muay Thai fighter Will Chope scored his 3rd win in-a-row (3-0) with another first round KO. MMA Strikeforce veteran Muhsin Corbbrey took his first Muay Thai fight as an MMA fighter winning with a 3rd round KO. Corbbrey also won his recent MMA fight for Tiger Muay Thai in Singapore’s martial Combat broadcast by ESPN and Star Sports from the World Resorts Casino on Sentosa Iland. On July 4, TMT fighters went 1-1 as Anders won with a 2nd round KO and Dino went 4 hard rounds before losing his first Muay thai fight.